However, there was some good news. The conductor, Antonio Pappano, was back to his best and really drove the evening along with great pace and care for his singers. The Pogner of Stephen Milling was also back to his best voice, but it was the position of Bryn Terfel who was the surprise of the night. 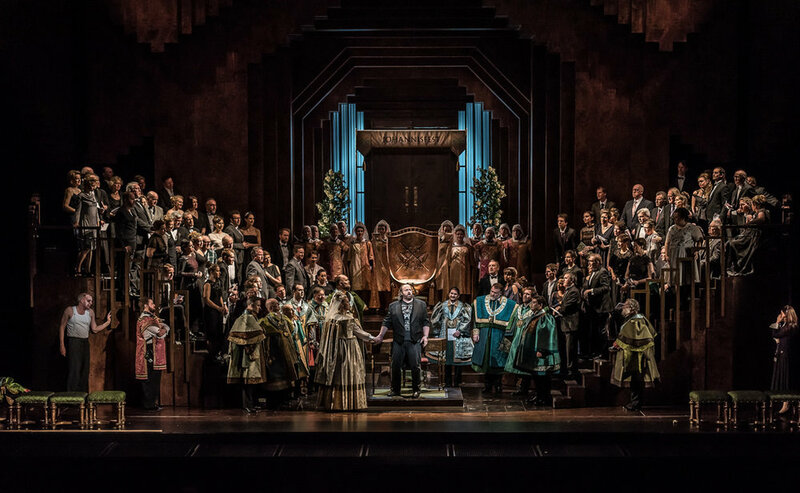 Having completed Act 1, Act 2 and half of Act 3, he became so unwell that the opera house was lucky enough to have the British baritone, James Rutherford, available to take over the last part of the performance, incorporating Walther’s song. He dressed up to look exactly like Terfel, with the same colour costume and beard and probably some of the audience would not have known the difference, until the applause when they both came on together, with Bryn apologising that the lunchtime oysters probably didn’t do his stomach any good! James Rutherford is interesting, because this young baritone starred as Hans Sachs for Bayreuth back in 2010 and has sung various Wagner roles throughout the world since that time. He sang outstandingly for his shortest of Royal Opera House performances.